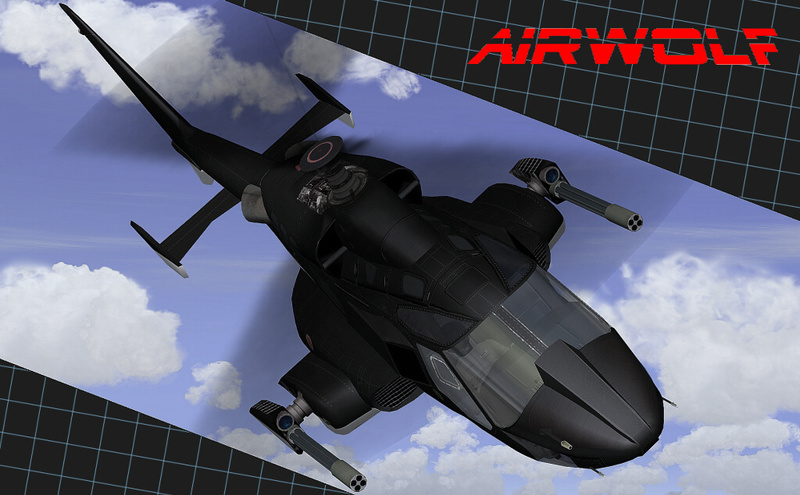 AFS-design brings a excellent rendition of the famous supersonic helicopter AIRWOLF from the same 80 years cult series AIRWOLF, and 2 models of possible opponents ( Concept Aircrafts ) of AIRWOLF, out for the Flight Simulator FSX and FS2004. The original series AIRWOLF is an American television series that ran from 1984 to 1987. It was about the sophisticated spy high-tech military helicopter, code named AIRWOLF, and took their team, which various missions. It was a lot of espionage and the theme of the Cold War. The series was produced by Donald P. Bellisario. There were 79 episodes, each with 45 minutes in length, in 4 Stafeln. In the first three seasons Jan-Michael Vincent played as Stringfellow Hawke for the pilot of AIRWOLF, Ernest Borgnine as Mr. Dominic Santini, owner of Santini Air Services and Systems Officer of the AIRWOLF, Alex Cord as Michael Coldsmith Briggs III ( CIA Code Name: Archangel ) CIA agent and in the second and third season, Jean Bruce Scott as Caitlin O'Shannessy, co-pilot of AIRWOLF with. The last season was recast with new actors. - Simulation of 4 x 30 000 hp burly AIRWOLF Engines.